We have completed a first draft of the second Hank Rangar book, tentatively titled Trails of Injustice. 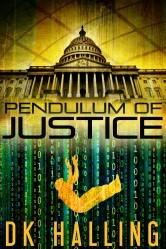 Hank is snared by a government conspiracy to undermine the constitution. Can you guess which recent government conspiracy it is? With two high tech start-ups going gangbusters, former cyber warrior Hank Rangar has finally “made” it. His lab, “Made By Man,” has revolutionized cardiac procedures, potentially saving millions of lives and billions of dollars. But, the most important person in his life is very sick and his technology is suddenly stolen. Hank discovers two things: This lifesaving procedure may be the only way to save his sister AND Big Washington will stop at nothing to bury it. Convert this to a movie script and sell it to Hollywood. Excellent theme and plot. Absolutely brilliant – that was my first thought after I finished reading this compelling novel.